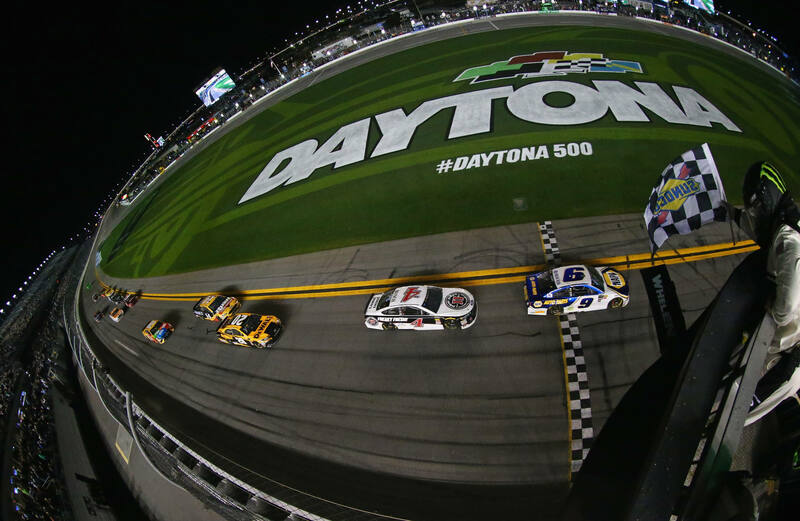 Tonight, it’s a short 60 laps around Daytona International Speedway. Points are on the line for the top 10 in each race. 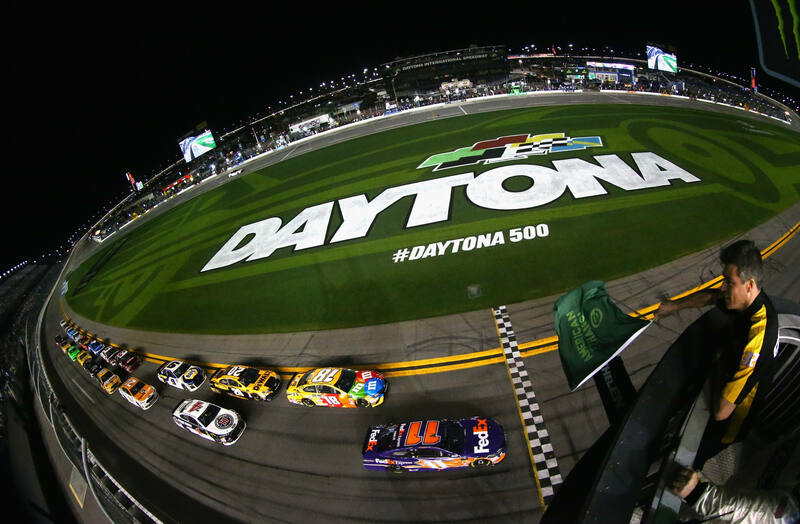 In addition, tonights Daytona duel race results will set the starting lineup for 3rd-40th in the Sunday’s Daytona 500. 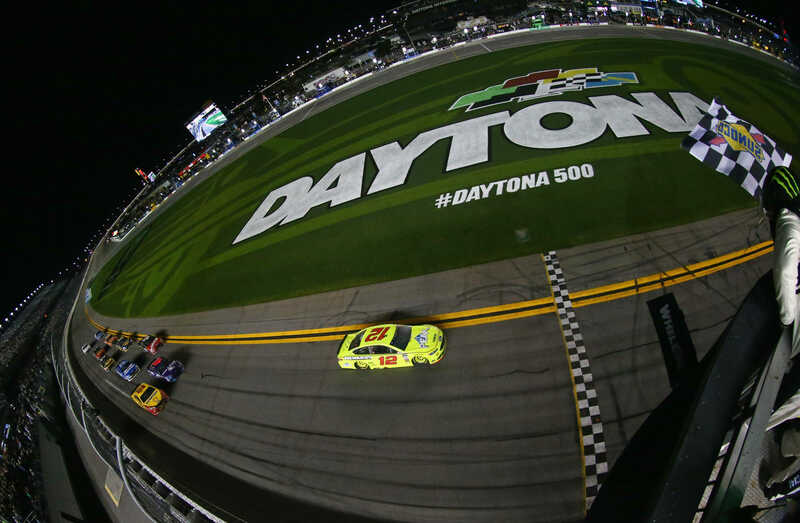 View full Daytona Duels race results below. 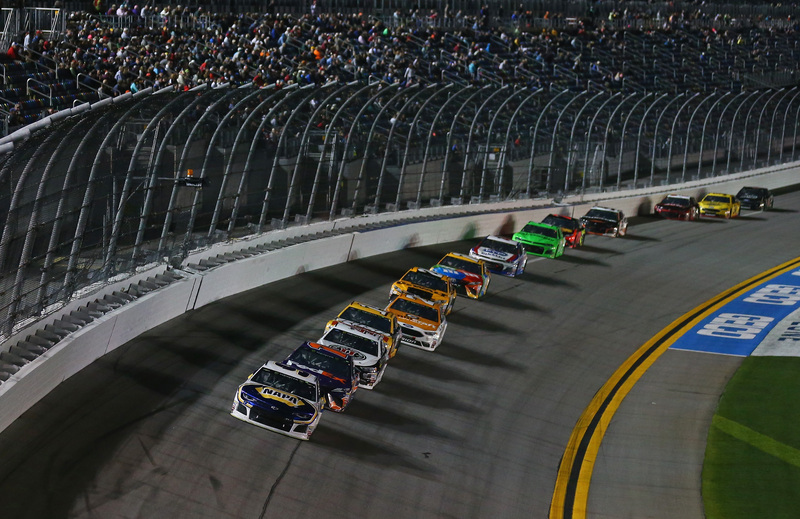 Alex Bowman and Jimmie Johnson lead the field to green in the first of two races tonight. Green, Bowman has his hand out the window before turn 1. He goes to the highside and falls all the way to last, on purpose. These are the same cars that will be used in the Daytona 500. Bowman will start on the pole, no matter his finish in this race. He’s elected to take care of his car. Suarez takes over the top spot. He’s coming around to lead lap 1. Nope! Suarez left the bottom lane open for Logano. The #22 throws sparks as he bounces off the apron. Logano sneaks by at the lien to lead lap 1. Lap 5, the field has formed a single file line. The entire field runs the outside line. Logano leads with Blaney and Keselowski trailing. Trouble! Jimmie Johnson pulled out of line through the tri-oval. Johnson might have seen a problem coming. Something broke on the rear suspension and the car turned dead right back in front of the field. Aric Almirola was the car that Johnson spun in front of. Almirola is out as well as Johnson. Suarez took on minor damage as well. “The car started to shake a little bit entering the tri-oval. That’s why I pulled down,” Johnson tells Fs1 after exiting the care center. Several cars hit pit lane. Green on lap 15, Logano opens up a 3 car length lead by the middle of turns 1-2. Logano is blocking both lanes. Four Ford drivers lead the field. Lap 18, the left rear quarter panel brace has broken on Ryan Newman’s car. The LR panel has bowed out like a parachute. He runs 4th. Lap 20, the field has formed single file around the top. Stenhouse is trapped on the bottom. He falls outside the top 10. Lap 30, the entire field is still single file around the top. Stenhouse, Kurt Busch and David Ragan are the only one’s on the bottom. Stenhouse is working his tail off to pass one car at a time. He has little help on his rear bumper, he using aggressive side drafts to make an attempt at a pass. lap 39, William Byron is around at the flagstand. Stenhouse side-drafted Byron and the air whipped Byron around on a dime. Moderate damage to the #24. The pits are open, the leaders stay out. Darrell Wallace Jr is the first car to head to the pits. 18 to go, the green is out. Blaney lifts on the inside line and Logano pulls down in front. McMurray isn’t a part of that game! He’s glued to Newman on the top, they pull even with Blaney. Lap 48, Stenhouse pulled low on David Gilliland into turn 1. He’s moving around the track more than anyone else by a multiple of ten. But, again, it’s same exact situation as Byron. No contact, the small air gap between the front and rear bumper sent Gilliland around. The rear end stepped out on Gilliland and he spun to the apron then back up the banking and into the outside wall. The yellow is out. Green, same restart game. Blaney stalls his start to let Logano to the bottom. McMurray nearly clears Blaney on the outside to breakup the Ford party, not quite. Stenhouse is 3 wide for 10th. He’s fighting! 6 to go, Logano leads. Stenhouse pulled himself to 8th. But, he’s the only car on the bottom. The field eventually builds momentum on the top. Stenhouse falls back to 12th. He’s still going! Stenhouse is putting on a show all by himself! 3 to go, Blaney gets a run on Logano. He pulls low, they run door to door for the lead. Logano loses all the momentum and drifts to the middle of the track. Keselowski isn’t sure which bumper to follow. He thinks about heading to the bottom with Blaney. Instead, he briefly cuts back to the right to stick with Logano. Problem, McMurray already filled a hole between Keselowski and the wall. Keselowski is hooked into the wall, he’ll be going to a backup car. Green, Blaney gets the jump on the bottom. His buddy Darrell Wallace Jr is on his bumper. Logano leads the outside lane. Blaney blocks both lanes. Stenhouse is 3 wide outside the top 5. Blaney leads by 4 cars lengths into turn 3. Logano has a run on Wallace Jr. They both have runs on Blaney. 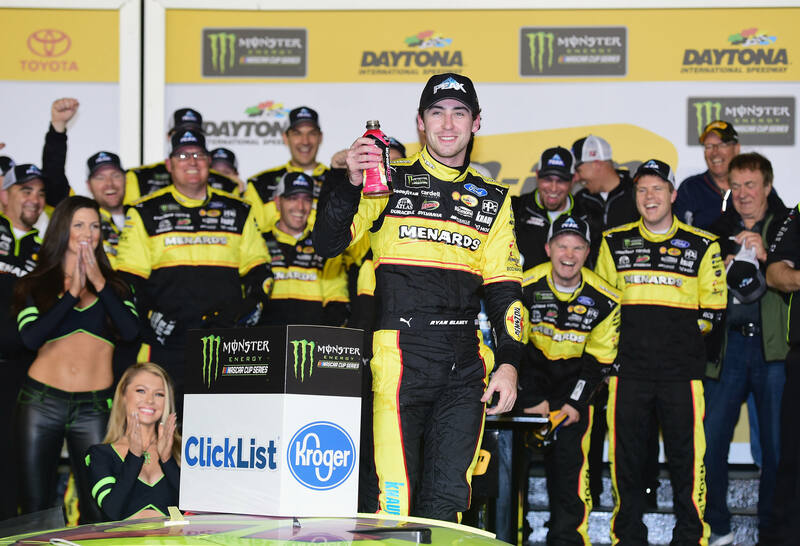 Blaney beats them out to the line to win Can-Am Duel #1. View full Daytona Duel 1 results below. We get to do it again. This time, Denny Hamlin and Kyle Busch lead the field to the green flag. Green, Kyle Busch delays his start and lets his teammate Hamlin slides in from the top to lead the bottom. Lap 2, the field has migrated to the top lane. Hamlin leads, Busch is 2nd and Jones is 3rd. Joe Gibbs Racing have parked themselves at the front. Lap 10, Menard, Harvick and Bayne have a run on the bottom. They are going to force Hamlin to move off the top to block. He does, and that has broken apart the Toyota gang at the front. Lap 12, Chase Elliott has a run through the middle off turn 2. Erik Jones pulls down to block, too late. Light contact but they all continue. Elliott remains on his left rear fender. The air pushes against the left rear and Erik Jones is around. Larson and DiBenedetto are involved. DiBurrito gets the worst of it. Larson is out as well. Danica Patrick missed it by inches, she doesn’t have a backup car for this weekend. Kevin Harvick is the first car off pit lane. Lap 15, green flag is out. Hamlin and Harvick race door to door, two wide through the entire field. Harvick leads lap 15 by inches. The top lane fades as Harvick leads the bottom. Hamlin has a run on Harvick, he takes the lead back! Elliott wants it, he takes over the top spot. 4 fresh tires for Chase Elliott. Most of the field elected for fuel only. Elliott had to serve a penalty for too many men over the wall, the team elected to take 4 tires. Lap 30, Chase Elliott leads the pack as they’ve migrated to the high side. Lap 45, same story, different page. The field is in a line around the top. Elliott is pulling the train. 5 to go, still single file. 2 to go, Harvick to the inside in turn 1, the Ford follow. Hamlin is hung out to dry. Menard is trying to move around Bowyer, he puts himself in the wall and scrubs off speed. Bowyer is back to the bumper of Harvick. 1 to go, Elliott leads by a car length off turn 4. There’s a run coming but their going to run out of race distance. 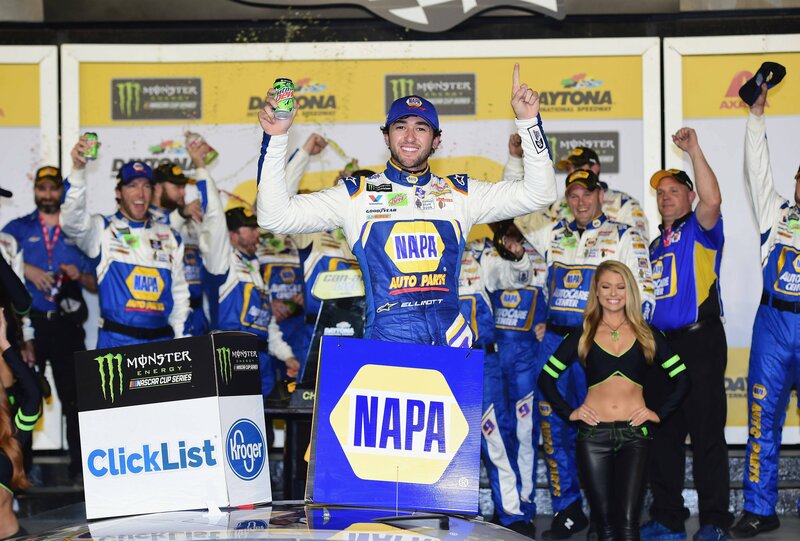 Elliott wins Can-Am Duel #2 at Daytona International Speedway. View full Daytona duel 2 results below.